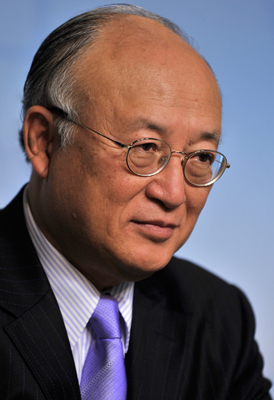 Director General of the International Atomic Energy Agency (IAEA) Yukiya Amano visited Iranian President Hassan Rouhani and other officials on Thursday. Both the IAEA and Iranian government discussed matters of cooperation between the two entities; they discussed the outstanding issues regarding the country's nuclear program which included a discussion to clarify military use of nuclear material. The IAEA also met with Iranian officials in the nation's capital Tehran in April and in February of this year in an effort to bring a resolution between the EU and Iran on a Joint Comprehensive Plan of Action. According to PresstTV the discussions in Tehran are mirrored with continuing negotiations between ministers and officials from the U.K., France, the U.S., Germany, Russia, China and Iran in Austria. The latest report from Reuters indicated that a resolution has yet to be made between both sides. The respective ministers are discussing the curtailing of the Iranian nuclear program so that those in the West can lift economic sanctions on the country. According to an official engaged in the discussions, Tehran officials expected that key international sanctions would be eliminated. Sanctions have been in place against the country following allegations of the nuclear energy program being used as a cover for the development of nuclear weapons.